This article is inspired by Financial Health Matters Day (#FinHealthMatters). When I was a kid, my mom told me to save for a “rainy day.” As an adult, I realized that saving for a rainy day was only partly right. Instead, I should save for rainy days and invest for rainy seasons, which could extend into months and years. As a kid, saving for rainy days meant I had cash to pay for a movie ticket when I couldn't play outside for free. As an adult, it meant having money for a car repair or the dentist's bill. As a kid, I didn't understand the need for longer-term savings and investments. As a adult, I quickly learned that investments could cover financial challenges associated with months of unemployment, household relocation, and more. Real-world lessons started early. I graduated from college during a recession. Unemployment stood at over 10%. Just a handful of graduating seniors landed jobs. Many deferred entry to the working world by going to graduate school. Some took jobs making minimum wage or slightly better just to draw a paycheck. After a 13-month job search that started the first day of my senior year in college, I considered myself fortunate to land a position as a financial analyst for a regional bank in a small town (not a large city as I had envisioned). During this time, my start-up expenses were heavy: I had to purchase pricey work clothes (prior to the advent of casual days) and borrow to purchase a car for transportation (there was no public transportation in this town). Still, I found a low-cost place to live with a roommate, cooked meals at home, hiked for free on the weekends instead of paying for entertainment, and stayed with friends on my vacations. Eventually, there was money left over at the end of each month. I set up an automatic transfer from my paycheck to a savings account and opted into my company's 401(k) plan. When I paid off my first car loan, I started investing in a regular taxable account. My first investment was in my utility company, which offered a dividend reinvestment plan (DRIP) to its customers like me. A couple of years after moving to this small town, my employer was acquired by a much larger one. I was tentatively offered a job with the big bank in a big city, but my calculations indicated that the cost of commuting and parking would consume most of any salary increase. By this time, I was married and my husband had a stable job with growth potential; it also offered excellent benefits and an employee stock program — both were becoming more and more attractive to me in terms of family finances. I decided to find a job in our adopted small town, a process that took months. When conversations about my latest employer being sold became commonplace, I decided to conduct another job search. During my transition to a new job, I took advantage of COBRA to bridge my healthcare coverage. The steep cost signaled the value of affordable health insurance (and eventually led to this article on choosing health insurance). These early days as a young adult taught me a lot about rainy days and rainy seasons. I learned that economic conditions were often fickle and unfair. They affected the availability of affordable housing, home prices and resale values, interest rates, the availability of steady jobs and job growth, salaries and wages, healthcare insurance, and more. At the same time, I gained a life-long motivation to save and invest. Just as important, I found that while I couldn't control the economy, I could control my financial decisions. I could buy the house with an affordable mortgage payment, cook at home as often as possible, find free things to do for fun, etc. Rainy days and rainy seasons arrived … in the form of recessions, stock-market tumbles, and more. When I got started, the amounts that I saved and invested were small. Shares of my utility company's stock were purchased with checks of $25 and $50. My first automatic transfer to a savings account was set up for $20 per pay period. Interestingly, a co-worker suggested that $25 was a better choice as my account could grow to $100 and increments of one-hundred dollars more readily. But I'd never discourage anyone from saving any amount. To me, saving for a rainy day (or a rainy season) is not a race. 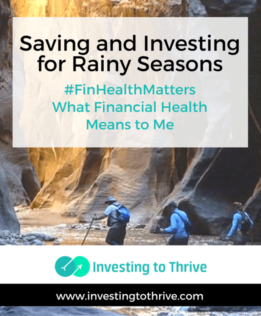 Financial health means positioning my finances to allow for saving and investing, which can be a plodding process not a sprint. It's certainly not about reaching an arbitrary goal as quickly as possible. Instead, it's being able to pay my bills and thrive during not-so-sunny days.